What if scientists found computer code embedded in our natural world? Not only that, but what if that computer code was identical to code found in, of all places, Internet browsers? Surely you would have to conclude that an intelligent mind had a hand in designing our natural world, and that it did not arise by chance. Because after all, there’s no way computer code – whether it be in Internet browsers or anywhere else – could “evolve” into existence on its own; someone must have put it there. 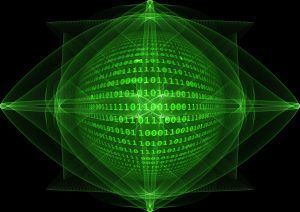 Well it turns out that a scientist has found computer code embedded in the fabric of reality – which points to strong evidence of a Creator. (The coding we’re talking about here is not that of DNA, which is another topic altogether.) 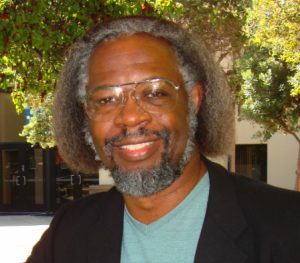 His name is S. James Gates, a theoretical physicist at the University of Maryland at College Park. He studies string theory and supersymmetry, which seek to explain how the most elementary parts of the cosmos work. Some time ago, when he was developing diagrams to represent equations in string theory, he noticed that these equations are indistinguishable from error-correcting coding found in browsers. In fact, the browser coding is a special kind of coding developed by a brilliant mathematician named Claude Shannon, a pioneer in information theory. Huh? That’s huge! Just as browser coding obviously had to have been written by an intelligent mind, the same is true for coding found in nature. It is stark evidence of an ultimate, ethereal Programmer. Dr. Gates’ findings are solid. University of Maryland physicist Tristan Hubsch assures that the discovery of coding in supersymmetry is a rigorously proven theorem. To be sure, one commentator points out that we’re not talking about literal computer coding such as found in C++ or Visual Basic; instead, it’s a type of math that’s indistinguishable from Shannon coding – which is a mathematical way to represent information. The probability of an RNA spontaneously forming from simple organic compounds in the primordial soup is essentially zero. There’s so much evidence for fine-tuning in the origin of the universe, pointing to a transcendent Creator, that scientists had to come up with the far-fetched multiverse theory to try to get around a Creator (even though a multiverse would need a Creator, too). Now, they’re doing a similar thing vis-a-vis the origin of life. There’s so much evidence that life could not have originated through random chance, implying that it had to have been designed by a transcendent Creator, that (some) scientists are resorting to quantum physics as a possible explanation. 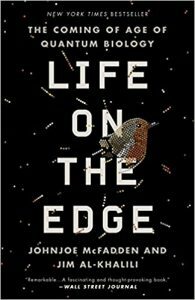 In their book Life on the Edge, Johnjoe McFadden and Jim Al-Khalili (the latter a science popularizer frequently seen on science television shows) discuss the impossibility of life ever originating on its own in the “primordial soup”. When in 1952 Stanley Miller and Harold Urey tried to replicate that primordial soup in the famous Miller-Urey experiment, all they came up with were some amino acids. Such acids are what proteins are made of. Proteins are needed for life to form. Also needed are nucleotides – which form DNA and RNA, the blueprints which instruct amino acids to form the millions of varieties of proteins. The authors cite the Scottish chemist Graham Cairns-Smith, who estimated that just to form an RNA from simple organic compounds in the primordial soup, there are some 140 steps involved. For each step there are about six reactions that have to be avoided. “So the odds of any starting molecule eventually being converted into RNA is equivalent to throwing a six 140 times in a row.” The chances of this happening are roughly one in six to the power of 140. But six to the power of 140 is far more than there are particles in the universe! McFadden and Al-Khalili write that the earth simply did not have enough molecules or enough time to enable anything like that to happen. 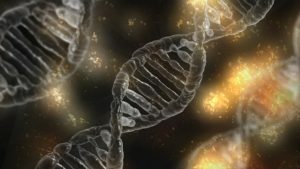 And that’s just the first step – random chance also needs to make ribozymes (a certain type of RNA) capable of self-replication. Random chance additionally needs to make proteins. “Clearly, we cannot rely on pure chance alone,” declare the authors. That points to obvious evidence of a transcendent Creator. But McFadden and Al-Khalili are scientists, and the job of scientists is to find natural explanations to things, not supernatural explanations to things – even when the evidence screams supernatural. So McFadden and Al-Khalili resort to quantum physics to try to come up with an explanation – and quantum physics is very supernatural-like. They suggest that quantum tunnelling (akin to going through solid walls) and quantum superposition (where a proto-enzyme can exist in all of its possible configurations simultaneously) played a role. Scientists often use the terms “weird” and “strange” to describe quantum physics, because things happen therein that from a classical physics perspective are like little miracles. In quantum physics, subatomic particles can be move through solid walls. They can be invisible. They can communicate instantaneously with a twin particle a billion light years away. And a single particle can be in many different, distinct places and configurations simultaneously. Scientists have no idea how these phenomena happen. They just know that they happen. They are stumped enough trying to explain how the natural physical world arose on its own. They certainly have no idea whatsoever how the quantum physical world arose, or how it works. It’s yet more evidence of a transcendent Creator. Studying biology is a religious experience. That’s especially the case today, with the advent of 3D animated videos (available on YouTube) depicting what goes on inside and outside our cells. Such videos display the wonderous engineering within our bodies – engineering vastly more sophisticated than any human-engineered phenomena (such as a car engine). The fingerprints of God are everywhere. Too bad those videos weren’t available when this reporter was in high school; I bet I would have taken biology a lot more seriously. I only was able to try to visualize what was going on by reading the printed word and looking at some pictures. My visualization efforts fell woefully short. To say everything arose by chance is insulting to one’s intelligence. If it did arise by chance, where are all the 3D animated videos depicting how that chance process played out? 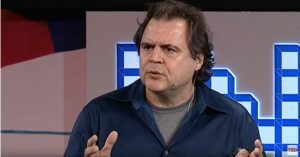 As associate professor of medicine and chief of scientific visualization at Yale University, Alexander Tsiaras and colleagues used new scanning technologies to see things about the human body “that just made one marvel,” he said in a TED talk. They were looking at collagen, which comprises much of the human body, a kind of rope-like structure that twirls and swirls. Collagen changes its structure in the cornea of the eye, becoming a grid formation in order to be transparent, as opposed to opaque. “So perfectly organized a structure, it was hard not to attribute divinity to it,” said he. That’s a strong case for the existence of God. It’s also a strong case against abortion. How could anyone so unceremoniously snuff out such a marvel of Divine engineering? Atheists are people of great faith. Atheists have amazing faith – in the power of spontaneous self-assembly. It takes more faith to believe that the raw materials of the universe and that the laws of physics arose from nothing, and that those raw materials somehow self-assembled into stars, objects and and living organisms, than to believe that they were designed by an intelligent agent. That’s particularly remarkable because such assembly happened in defiance of the second law of thermodynamics – that things naturally go from order to disorder. Cup with your hands some empty space in front of you. Then imagine nothing is there – not even any molecules. If you lack faith in God, then you believe in the unbelievable notion that (1) the laws of physics somehow appeared on their own, (2) subatomic particles such as electrons and quarks somehow appeared, (3) those particles somehow self-assembled into atoms, (4) those atoms somehow bonded to form molecules, (5) those molecules self-assembled into inorganic matter, (6) they also somehow self-assembled into in organic matter, namely amino acids as well as DNA, (5) those amino acids somehow self-assembled into proteins, all on their own, (6) those proteins somehow self-assembled into cells, and (7) those cells somehow self-assembled into bacteria, insects, plants, animals, and humans. If you believe all that happened without the input of an intelligent agent, then you have a lot of faith in the impossible. You have faith in things for which there’s no evidence – not even circumstantial evidence. On the other hand, there’s a lot of circumstantial evidence for God. Just as a house is circumstantial evidence that it was created by a human or humans (not direct evidence because we didn’t directly see anyone building it decades ago), a tree or an animal is circumstantial evidence that it was created by an intelligent agent, i.e. God. Take a pile of of Lincoln Logs. Watch them during the course of your lifetime and see if they ever self-assemble into a log cabin. Or add a stimulous – keep throwing them up in the air over the course of your lifetime and see if they ever land on the floor in the form of a perfectly assembled log cabin. 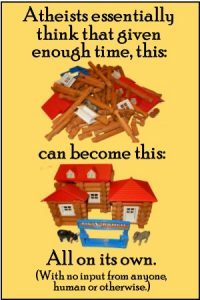 It’s much harder for the above-mentioned particles to self-assemble into the above-mentioned complex objects than it is for Lincoln Logs to self-assemble into a log cabin. So to reiterate, given the abundant evidence of an intelligent creator, it takes more faith (in the non-god of nothingness?) not to believe in Him than to believe in Him. Whittaker Chambers was an American who spied on behalf of the Soviet Union during the 1920s and 30s. He stunned the world after he abandoned communism and outed Alger Hiss, a high-level U.S. government official who was a communist agent. What made Whittaker Chambers abandon Communism? It was a newfound belief in God, given that Soviet Communism prohibited religion. What made him start believing in God? His daughter’s ear. To Whittaker Chambers, his daughter’s ear was evidence of God’s handiwork, such compelling evidence that it prompted him to believe in God, become a Christian, and abandon Communism. The prevailing assumption is that evolution designed the human ear. Everything can be explained by science, or so it seems. Back in pre-modern times, people attributed unexplainable or seemingly miraculous things to God or gods. They didn’t have the concept of evolution or chemistry to explain life and the origin of life. Then beginning around age of the Enlightenment in the 1700s, people frequently questioned the Church and the Bible in terms of explaining the natural world, and instead use science to do so. So now science explains everything. Or does it? Actually things are coming full circle. Science is has progressed so much that we’re finding out extraordinary things about the natural world that science can’t seem to explain. It’s really intriguing stuff; the deeper you delve into the science of it, the more it seems that a super-intellect was involved in not only the creation of the universe, but of biological life. To be sure, these sorts of scientific discoveries, or more accurately scientific inferences, aren’t required to form the basis of one’s faith in God; after all, billions of people are and have been strong believers even though they’ve never heard of such scientific developments. And should scientists sometime down the road produce convincing evidence that the universe and/or biological life originated through purely physical processes – which is highly unlikely – then that should by no means shake one’s faith in God. But still, for believers and nonbelievers alike, these developments in the world of science are very, very intriguing. One of those developments involves what they’re finding out about the Big Bang and how exquisitely fine-tuned it had to be in order to produce a physical universe that can support life. To be sure, let me put to rest the notion that the Big Bang is “just a theory”. Physicists, astronomers and cosmologists now almost universally agree that the universe started about 13.8 billion years ago with the Big Bang. There’s plenty of evidence to support that, including Edwin Hubble’s discovery 90 years ago that the universe is expanding and Penzias and Wilson’s discovery 50 years ago of the cosmic microwave background radiation or CMBR, which scientists think only could have come from the Big Bang. Prior to the Big Bang theory, scientists from Newton to Einstein accepted the so-called steady state theory in which they thought the universe always existed and was infinite. That theory clashed with the biblical account that the universe had a beginning. But with the confirmation of the Big Bang, evidence was overwhelming that the universe actually did have a beginning – just as was stated in the Bible. But what is most extraordinary about the Big Bang is the incredible fine-tuning that went on. Scientists discovered that the rate of expansion during the first seconds of the Big Bang was so finely tuned that had that rate been even one quintillionth of a second slower or faster, the universe either would have collapsed in on itself into a black hole, or expanded too rapidly for stars and planets to form. And the rate of expansion was just one of many factors that had to be exquisitely exact in order for the universe to develop and life to eventually form. 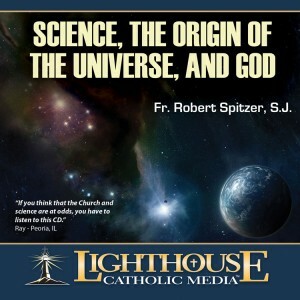 Physics expert and Catholic priest Robert Spitzer, in a talk titled “Science, the Origin of the Universe, and God”, discusses some of these factors. One is that you need a so-called low-entropy universe. The odds of this happening as a result of the Big Bang is on the order of one in 10 raised to the 10 raised to the 123, which is for all practical purposes infinitely remote. Other factors that had to be finely tuned include our physical constants or laws of physics. They include the force of gravity, the speed of light, the strong and weak nuclear forces, and the electromagnetic force. The value of these constants could have been anything as a result of the Big Bang. But they just happened to be the exact amount in order for life to develop. It’s truly extraordinary that all of these laws of physics happened to be exactly right for life to develop. That this happened by chance is, to take an oft-used analogy, like saying a monkey can type the entire corpus of Shakespeare in two weeks just by randomly tapping the keys. Of course that’s highly, highly unlikely – essentially impossible. The obvious conclusion is that there had to have been a superintellect, i.e. God, who designed the Big Bang. Sir Fred Hoyle is a famous scientist who went from atheism to theism after finding that something called resonance levels in chemistry had to be an exact amount in order to have carbon bonding. Achieving that amount was highly improbable through random chance. 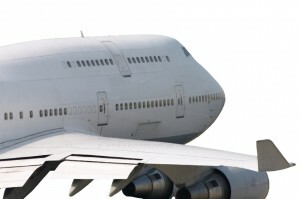 Hoyle compared the development of life in the universe by pure chance to a tornado sweeping through a junkyard assembling a Boeing 747 ready for flight, and I may add, complete with the Boeing logo painted on. Most scientists acknowledge this fine-tuning of the universe, and to come up with a natural, as opposed to supernatural explanation, they’ve proposed the multiverse hypothesis, in which ours is one of zillions of universes. Their reasoning is that if you have enough universes popping into existence, then there’s a chance that among quadrillions and quadrillions of bubble universes, each with different laws of physics, then one of them may just happen to have the right laws of physics suitable for life. But that theory is speculative, and as physicist Paul Davies quipped, “To invoke an infinity of other universes to explain one is surely carrying excess baggage to cosmic extremes.” And besides, a multiverse would need a creator, too. So the field of cosmology reveals strong circumstantial evidence of God. There’s strong circumstantial evidence of God in the field of biology as well. 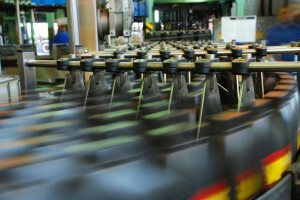 Think of a factory, such as a snack cake factory or a bubble gum factory, and the complex automated processes used to mass produce those products. Human ingenuity is truly amazing. Well those complex automated processes that humans set up pale in comparison to the complex automated processes that go on inside the cell, especially with regard to DNA and cell replication. You mean to tell me that no one conceived of or set up all of that sophisticated engineering? That everything randomly fell into place over the course of millions of years? That’s what Darwinists believe. To be sure I’ve always been a strong believer in evolution and still am, but I’m finding out that there are limits to evolution. It doesn’t explain everything, such as how DNA and protein production originated. It’s like saying all the components of that snack cake factory gradually and randomly just fell into the right place over time. The way DNA creates new proteins is remarkably similar to CAD-CAM processes – computer-aided design and manufacturing. A 3-D model of a part, for example an automobile part, is created on a computer screen, and that information is stored with binary code. Then another computer program translates that binary code into a machine code. That in turn directs the machinery such as a robotic arm to make the part. It takes a lot of intelligence to set up a process like that, wouldn’t you agree? 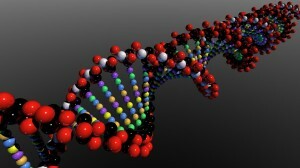 Well the similarities between that process, and the process by which DNA makes parts for the cell (i.e. proteins), are striking. Doug Axe of the Biologic Institute recounted a story where in college and grad school he first studied engineering and then switched to biology. He remembers a professor in a lecture hall describing an elaborate control circuit on how the cell turns on and off a chemical called tryptophan. In a very clever way it switches a suite of genes on if it doesn’t have enough and off if it has enough. Having studied control systems theory at engineering school, he remembers sitting there and being blown away. “I realized I was looking at the product of engineering – remarkable engineering.” While things like this were given a Darwinian explanation, he didn’t find that at all compelling. Scientists have attempted to explain what gave rise to such biological processes from a scientific perspective. But based on what I’ve been reading, their explanations fall woefully short. Just as the Big Bang needed a designer, so did life on earth. 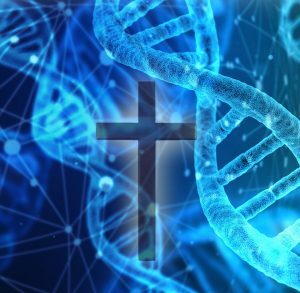 Biologists including Michael Behe of Lehigh University and Stephen C. Meyer of the Discovery Institute are putting out some very compelling stuff on intelligent design. For a good overview of the ideas here, watch The Case for a Creator or other DVDs available at Illustra Media. If you’re willing to get into the nitty-gritty of cell biology, read Stephen Meyer’s book Signature in the Cell. And then there’s question of how life originated in the first place. One of the most famous scientific experiments was the Miller-Urey experiment in 1953, in which Stanley Miller and Harold Urey tried to recreate the primordial soup of the early Earth to see if it would lead to life. It didn’t – it only lead to some amino acids, which are among the building blocks of life but by themselves are woefully inadequate to lead to life. Statistically, as detailed in Signature in the Cell and elsewhere, the odds of amino acids coming together to form functional proteins are infinitely remote. So did that shake Crick out of his atheism? No. He proposed that the seeds of life were sent here on a spaceship by some alien civilization. Apart from cosmology and biology, yet more proof of the existence of God, of an afterlife, and of higher dimensions are near death experiences (NDEs), which we’ll only lightly touch on here but of which there is vast literature including many peer-reviewed academic papers. Whereas the other categories can be viewed as circumstantial evidence, NDEs and other such accounts can be viewed as eyewitness evidence. It is medically inexplicable to have a highly organized and lucid experience while one is unconscious or clinically dead. Blood doesn’t flow to brain, and brain activity stops. NDEs may involve seeing and hearing actual earthly events in an out-of-body state, and what they perceive is nearly always accurate. NDEs often occur during anesthesia when no form of consciousness should be taking place. Blind persons who’ve had NDEs described actual visual objects and colors in earthly physical locations. Life reviews are often associated with NDEs, in which the person recalls events completely forgotten. Virtually all beings encountered during NDEs are deceased, and most are relatives. The striking similarity of children’s and adults’ NDEs strongly suggests the content of NDEs is not due to preexisting beliefs. There’s a remarkable consistency of NDEs around the world. Those who’ve had NDEs often are transformed in many ways for life. In addition to NDEs, there are many reports of other types of mystical experiences, such as seeing apparitions of the Virgin Mary or seeing Jesus in a dream. Former Clinton administration official Kirsten Powers claims that she saw Jesus in a dream, in which he said, “Here I am.” That helped prompt her to go from being an atheist to a Christian. She describes her experience in an article in Christianity Today. Here are some extraordinary things that people believe. a single entity can be in multiple locations at the same time. Sounds like what we associate with angels and the supernatural, right? Yes, but that also describes quantum physics, which looks at how subatomic particles behave. So if hot-shot Ivy League scientists verify that such things happen in the quantum physics world (and they admit they can’t explain how it happens), then it’s not a stretch to believe that such things happen involving the spiritual world. In fact, given the similarities between quantum physics and supernatural experiences, much has been published on the convergence of science and religion. See YouTube videos such as Quantum Physics Debunks Materialism or The Simulation Hypothesis. Also see YouTube lectures by Professor Keith Ward on quantum physics, as well as “Does Quantum Physics Make it Easier to Believe in God?” by Stephen Barr. So in a sense, science has come full circle. Previously, science explained away popular religious conceptions, such as what causes the sun to travel across the sky or what causes differences in species. 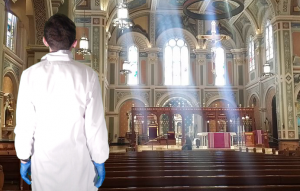 Now, as our knowledge of science becomes even deeper, science is leading many to religion, such as those scientists shaken from their atheism or agnosticism, referred to above. Let me conclude by recounting a mystical experience described by Whittaker Chambers, which took place in his Baltimore home after coming down his stairs. 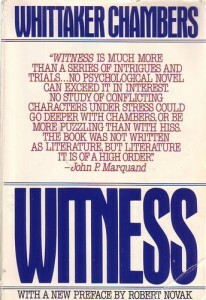 Here’s how he described it in Witness.